Cisplatin’s action inside the cell is familiar to anyone who took organic chemistry in college: it’s a nucleophilic substitution reaction (and remember, DNA is deoxyribonucleic acid). The shape of the cisplatin molecule is square and flat. Its covalent bonds readily exchange with other ligands, including even water. In the aqueous environment of the body, the chlorine atom in the cisplatin molecule is easily replaced by a hydroxyl group, and later by part of the DNA. If there is high chloride concentration in the bloodstream, this substitution reaction doesn’t go as far. If there is a low chloride concentration in the bloodstream, the cisplatin becomes so reactive it bonds to other proteins; cancer-fighting efficacy declines. Chinese scientists recently found that cisplatin induced loop structures and condensation in the DNA. This was attributed to the DNA's "thermal fluctuation". The term "alkylating" derives from the drug’s mechanism of action; an alkyl group signifying a single, covalently bonded carbon atom. Alkylating agents are capable of forming strong electrophiles usually via a carbonium ion or carbon radical. These electrophilic compounds seek out nucleophilic atoms and functional groups to form their covalent bonds. Nucleophilic functional groups include phosphate, amino, sulfhydryl, carboxyl, and hydroxyl groups, among others. One atom that is particularly susceptible to alkylation is the nitrogen number 7 in the guanine nucleotide of DNA. Transplatin, (an isomer of cisplatin that has the chlorine atoms opposite each other, rather than on the same side) also forms adducts with DNA, but mostly mono-adducts. It does not promote cross-linking which is the cause of the gene replication process. The cisplatin molecule binds with a protein on one side and the DNA molecule on the other. The protein is critical; it protects the cisplatin molecule from being removed by DNA repair mechanisms in the cell. The cis-PtCl2(NH3)2 compound was first documented by the Italian chemist M. Peyrone in 1845, and it was originally referred to as Peyrone's salt. 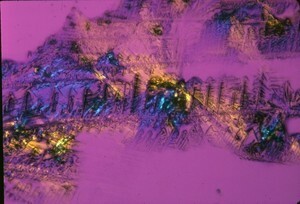 In the 1960s, scientists at Michigan State University used platinum electrodes to produce cisplatin. It was first found to inhibit e. coli bacteria's ability to reproduce by preventing binary fission. Its first use in cancer treatment was for sarcomas that were artificially implanted into rats. Scientists found that the drug was effective in treating sarcomas and proceeded to do clinical trials on humans. Cisplatin was approved by the Food and Drug Administration in 1978 for a variety of cancers and is being used to this day. Cisplatin is often employed in conjunction with other drugs for maximum effect in what are called combination therapies. (For example, one of combinations is cisplatin with vinorelbine and ifosfamide to treat advanced non-small-cell lung cancer. Another combination, used for locally advanced cervical carcinoma, is gemcitabine and cisplatin.) To provide the best care for the patient, investigative drugs are sometimes used with cisplatin since the effect may be measured against known data to see if the investigative drug improves the patient's condition. This way the patient does not have to quit an effective treatment to test another drug's effectiveness and possibly regress. A recent meta-analysis found that cisplatin was effective in improving survival for patients who had lung cancer surgery. Researchers said their findings "confirms that adjuvant cisplatin-based chemotherapy is of benefit in completely resected NSCLC". Thus an old chemotherapy drug proves its worth, even in the face of fancy new drugs that are on patent.